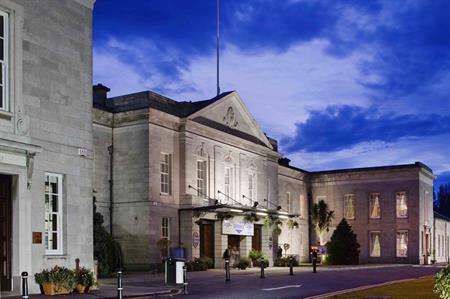 The RDS, a conference venue located in the village of Ballsbridge in Dublin, has launched the RDS Conference Village, a collaborative initiative between the RDS and local hotels and businesses to encourage international conferences and exhibitions to the area. The aim is to attract over 10,000 delegates per annum which equates to an economic impact of €15 million to the local area. To date the initiative has been been successful in securing two conferences, PCI Security with 500 delegates and Gamestop with 350 delegates. In 2012, the RDS hosted a number of conferences including the International Eucharistic Congress with 35,000 delegates, OSCE with 1,200 delegates, and the Dublin Web Summit with 3,000 delegates.